Updating syllabi for most of the university-affiliated colleges takes place once every five years irrespective of new scientific discoveries and availability of new technologies. This should change and I am hopeful it will, but what till then? In my experience, practical courses give relatively more freedom and flexibility than theory courses to try new teaching approaches. One of such ‘experiment’ I tried was blending isolated prescribed practicals into a consolidated, mini-research project. I have found conducting practicals as a small project is especially important for those UG / PG courses where students don’t get any exposure to doing research projects. Starting with a probable questions in relation to the prescribed practical (instead of the usual ‘Aim’) followed by hypothesis-building (instead of lengthy prologue) certainly excites the young minds. This can lead to a good experiment design where students participate and discuss their own ideas and approaches. The process can be very enriching for students to understand various scientific concepts as well as specific, subject-related techniques that they can try. I have been following this strategy in practical courses I teach for some years now. For example, in PG Bioinformatics practical course (MSc 2nd year), I ask students to select genes or gene products that they are interested in. We perform all practicals as prescribed by the curriculum, with students using their selected biomolecules to complete the experiments. The added benefit here is that this exercise helps them in their Thesis research projects the following year — they may choose to continue to work with the same biomolecules of their choice and deepen their understanding of the concerned topic of research using bioinformatic tools we cover in the class. As another example, in my Environmental Biology course (MSc 1st year), I blend all the separate practicals (Isolation of microorganisms from polluted soil, Qualitative and Quantitative analysis of Pesticide degradation, Genotoxicity assay and pollen germination assay; Estimation of TSS, DO, BOD and COD: Acquisition of “Google Earth” images) in a small outcome-oriented research project. 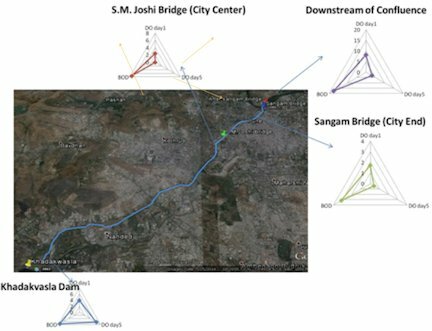 For one batch, we tried understanding the pollution status of Mutha river flowing through Pune. My idea was for them to check the status of the river whilst performing all the techniques mentioned in the syllabus. Biochemical oxygen demand (BOD) and suspended solids were determined for the water samples taken from four locations along the river. A very simple Wrinkler’s Dissolved Oxygen estimation method was used. We tested Genotoxicity of same river water via assays given in the syllabus. We compared the samples with the intent of answering a broad question: the health status of the river. It gave us an estimate of the degradable organic content of the water sample. Students divided themselves in groups and collected samples right from the mouth of river where it enters the city from the Khadakwasla dam to the confluence of the Mutha and Mula rivers and further downstream. I took weekly feedbacks from these groups to put everyone on the same page and monitored their progress. They surveyed the scientific literature to finalise methods and analysis of their results. Some of the results were as expected but some were not, like for example, the BOD upstream of confluence was anticipated to be low but it was higher. The discussions over the results gave me a chance to clear few fundamental concepts and also gave them clarity and confidence so as to independently carry out basic research work. More than that, they all did their part to raise awareness toward their own city environment, to which they can relate to and hence appreciate the course more. The results showed that the river is in a dire need of attention for its health improvement and survival of life depending on it. Examples I have shared in this, and previous article, can be seen as anecdotes but they started as trial and error experiments by an unsatisfied teacher. The golden balance between pushing the boundaries of rigid syllabi by active scientific teaching and the performance of students during centrally assessed examination is not always easy to achieve. There are issues that I cannot change of the present education system but there are still more that I can change within the boundaries of the given framework. I strongly believe that as educators, the way we conduct any course we are charged with, and the ways in which to get the most out of the syllabus, is in our hands.